First, you will need to open the iPhone or iPad settings. This is the settings app that looks like gears running. Next, scroll down (the left-side menu on the iPad) until you locate General. Tap on General to open the General settings (it will appear on the iPad in the right-side window). Tap on the second option from the top in the General settings, Software Update. After tapping Software Update, the iPad will move to a screen displaying the version of iOS running on the iPhone or iPad. If you are on the most current version, it will read: "Your software is up to date." This page will also give you the current version number you have installed. If you are not on the latest version, you may see information on downloading and installing the latest version of iOS. This is a relatively easy process. You should make sure you have a current backup before starting the update, and if your device is below 50% battery power, make sure you plug it in before starting the update. 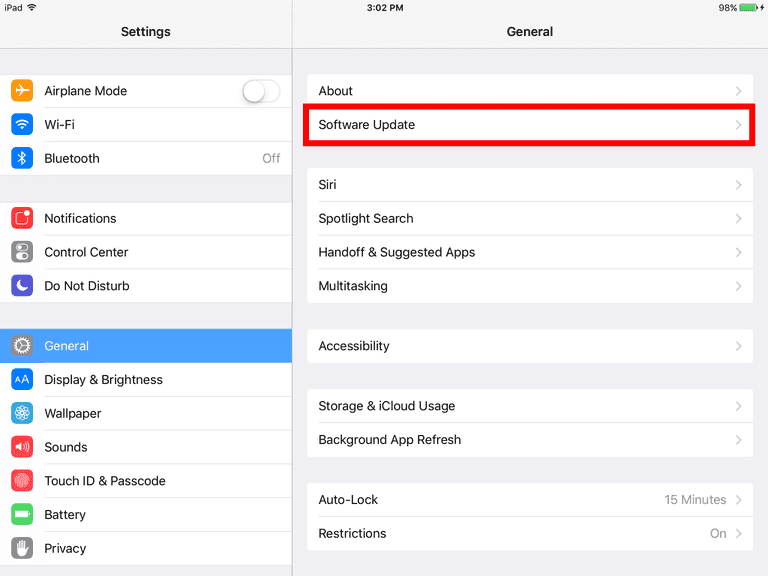 Why Is It Important to Update to the Newest Version of iOS? It is always very important to keep your iOS devices updated. In addition to squashing bugs and tuning performances, iOS updates include security fixes. It is very difficult for malware to find its way onto your iPhone or iPad unless you jailbreak it, but there are other vulnerabilities hackers can use to get at the information stored on your device. Outdated or obsolete devices, such as the original iPad, will not be able to download the most recent iOS updates. This is because older devices do not have the processing power or memory needed to run the latest versions of the operating system.